While Mon was holding down the Chi, my sister and I decided to take a side trip to Minneapolis on our return from Canada. This is where the addiction kicks in. Hello My name is Kate. (Say “Hi Kate” everyone). It’s been 10 minutes since I last checked Air and Air B. My sister introduced me to this website/app where you can find private rooms, whole levels of houses or full apartments to rent from private owners. At first.. I was hesitant to try but now I’m all Dr. Seuss like “oooooh the places you’ll go”. 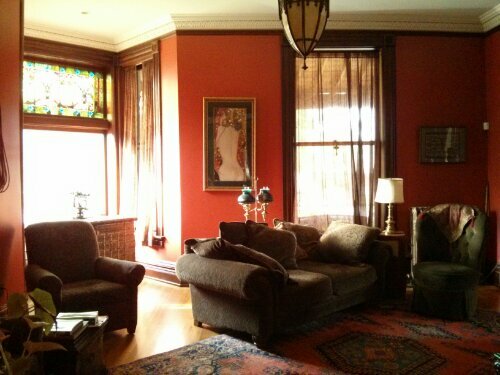 We stayed at a beautiful 1800s styled mansion in St. Paul with an unbeatable view of the city. The owner, Scott, was hospitable and unobtrusive. He set out breakfast for us each morning: blueberries, craft jams, whole grain English muffins and cereals and fancy coffee. The one thing we couldn’t get over was the bed. Ahhh I dream of the sheets. It’s a wonder what quality soft sheets can do. We stayed in bed until 11 am the first morning reveling in the sleek feel. 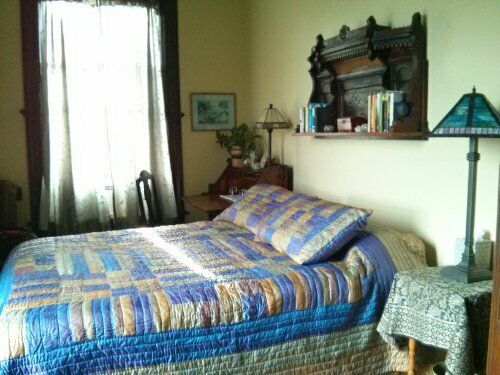 Although I can’t guarantee every Air B and B has this sort of luxury, if you stay in St. Paul, you will feel like a Downton Abbey uppercruster. Check out Air B and B here. Since Mon missed out, I’ve begun to draw her into my web of travel. Lofts in Paris, tree houses in Hotlanta, swank pads in LA, here we come!